If your answer is a resounding “yes” (with jazz hands) then you should drop the idea of getting theatre tickets by driving all the way to the theatre halls, or waiting in the a long line at TKTS. TodayTix is at your service, there is no need to head to the theatre to get the tickets when you have the TodyTix mobile app that allows the users to get desired tickets by tapping on a mobile screen (probably like the one you’re reading this on). How Does Today Tix Lottery Work? You can purchase Broadway (and off-Broadway) tickets from the mobile app, with so much ease and the comfort of your khakis. You can either buy a full price ticket or a half price ticket for countless theatre shows which are taking place in London, Chicago, California and London. Get a hassle-free ticketing service with Today Tix. From your phone or tablet, you can book the tickets at your convenience. Booking theatre tickets is no longer a logistical nightmare for theatre lovers. With TodayTix, you can instantaneously get theatre tickets at your desired time. You can get a wide range of options on various shows such as operas, Broadway shows, musicals, plays, off-Broadway theatre and more. Browse through a long list of theatre shows which have been listed on the app and book the tickets. Easy as 1, 2, 3. Reserving tickets is just a few taps away. TodayTix gifts its theatre lovers with the ability to win heavily-discounted tickets and even free tickets to their chosen shows through their lottery system. 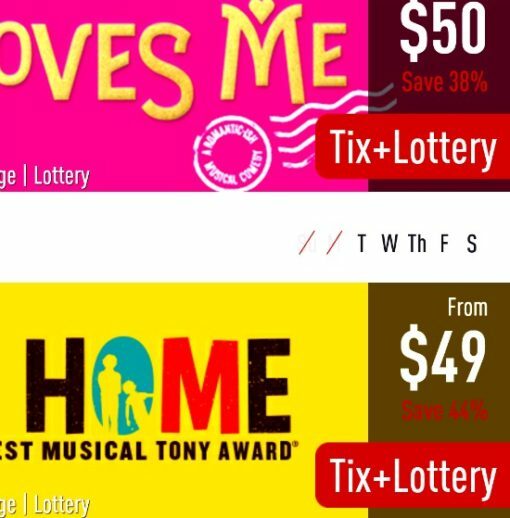 You can potentially get cheap tickets to shows like Fun Home, Wicked, and to public previews of upcoming shows. Download the TodayTix app in your mobile or tablet and submit your information over the app. The selection process of lottery system is completely done on a random basis. After you’ve entered, you cross your fingers and wait. Prior the theatre show, the name of the winners is declared. The winner or winners receive a notification on their mobile device and via email. Within an hour, you have to claim the tickets by using the app. If you don’t claim the lottery tickets within an hour, they’ll be passed on to the others on the lottery waiting list. You need to download the free mobile app, Today Tix, in your mobile or tablet. Download TodayTix from Amazon App Store, Apple App Store, or Google Play Store. The next step is that you have to type your name, email address, contact number and the number of tickets you want to buy for your chosen performance. The validity of the entry period begins from the midnight and goes on the next day an hour before the show. Wait and do all your lucky rituals. Unfortunately, there’s no tips or tricks to increasing your chances — I guess you can download TodayTix apps onto your friends’ phones and enter with their info for more chances, but really, it’s just following this process every time. Good luck!